Marking a significant milestone in its expansion, SCHOTT KAISHA today inaugurated its new pharmaceutical packaging plant in Jambusar, Gujarat. This greenfield investment of 20 million Euros increases the company’s production capacity in India by 50 per cent to around 2.0 billion ampoules and vials per year. The new plant in Jambusar has 20 production lines for ampoules and 16 for vials, with scope for further expansion. Its fully automated production process uses high-end robotic feeding technology for tube-loading as well as high-precision camera inspection systems. World market leading SCHOTT FIOLAX® tubes are used as base material. The facility is India’s first pharmaceutical packaging plant meeting global standards with an ISO 15378 certification. This underlines the company’s commitment to the international GMP (Good Manufacturing Practice) standard. 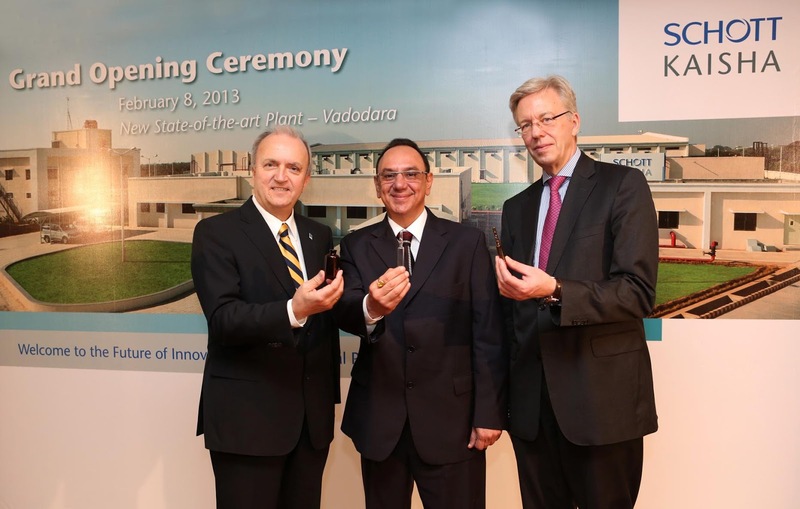 “KAISHA’s deep market knowledge about India and SCHOTT’s world class technology create a perfect partnership,” emphasizes Prof. Udo Ungeheuer, Chairman of the Board of Management of SCHOTT AG. “The SCHOTT group is highly committed to its pharmaceutical business. Our continuous investments in India demonstrate our ambition. More than one hundred years of experience in setting the world’s highest technology standards turn us into the ideal partner for India’s ambitious and fast growing pharmaceutical industry,” he adds. According to several studies, the pharmaceutical market in India is expanding by approximately 14 to 17 percent per year. Expansion will continue to be driven by demand from India’s prospering middle class. The government also supports this development financially: It plans to set up a 639 million US$ venture capital fund to boost drug discovery and strengthen the pharmaceutical infrastructure. The packaging market is expected to grow in line with the overall pharma market by about 11 percent annually. SCHOTT KAISHA is confident of exceeding overall market growth also in the future. The Indo-German company offers a complete range of primary tubular glass packaging: Products comprise ampoules, vials, cartridges for pen and auto injectors as well as sterile pre-fillable glass syringes. Since its formation in 2008, SCHOTT KAISHA has achieved steady, profitable growth. As a result, the 50:50 joint venture today employs about 1,600 people in its plants in Daman and Jambusar and its Mumbai office.